This is actually a couple of bigger waterfalls separated by a short stretch of stream with slides and cascades. The upper fall is more complex and about 30 feet high, while the lower one is about twice as high but more of an even slide. 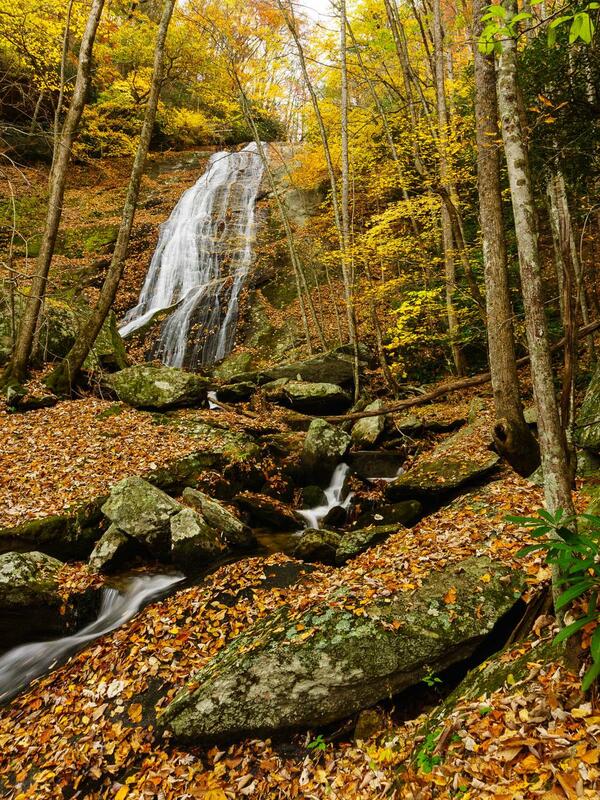 The upper drop of Little Lost Cove Creek Falls. At the upper drop, a series of slides culminates in a cascade into a large, clear pool. The cascade is interrupted by a huge boulder - stacked on top of others - halfway down the cliff face. The water goes into a short free-fall and tumble around the boulders before spilling gently into the pool. The lower falls, by contrast, is a fairly straightforward, steep slide. There is an angled crack at the bottom which diverts some of the water, and little ledges break up the flow and send it in little streams going various directions. This waterfall looks best in moderate to high water flow. From the intersection of US 221 and NC 105 in Linville, NC, take US 221 S for just over 1/2 mi to NC 181/US 221 S. and turn left. Go 2.9 mi and turn left to stay on NC 181 S. Go 2.5 mi and turn left onto Pittman Gap Road (just past the Blue Ridge Parkway). This road winds up the ridge for just under 1 mile to a stop sign. Turn left onto Mortimer Road. Go 0.5 mi and turn right at the white church onto the gravel Old Mortimer Road. This road becomes FS 464 shortly and begins winding down the mountain. 2.5 mi past the white church you'll pass Kawana Road (FS 58) on the right; continue straight on FS 464. 4 mi past the white church you'll reach FS 464A, which cuts back sharply to the left. If you have a reasonably high-clearance vehicle and the gate is open, continue 0.8 mi down 464A and park at the end at a camp site. 4wd was not necessary last time I visited but might help if the road weathers some by the time you visit. There is one minor creek crossing about 2/3 of the way to the end. If the gate is closed or you're not driving, you'll have to park at the intersection and walk down this stretch of road, adding 1.6 mi to the overall hike. Note: reaching this falls requires a very steep, somewhat dangerous descent down a mountainside, and is not recommended for casual hikers. Just before the camp site, the old road bed goes left and over some dirt mounds built to keep vehicles off the rest of the road. A Forest Service sign states that the road is closed to vehicles, but welcomes foot travel. The old road/trail curves gently through some side coves, crossing a few tributary branches along the way during wet periods. The forest is mixed, with a handful of dying hemlocks sprinkled in with the hardwoods. 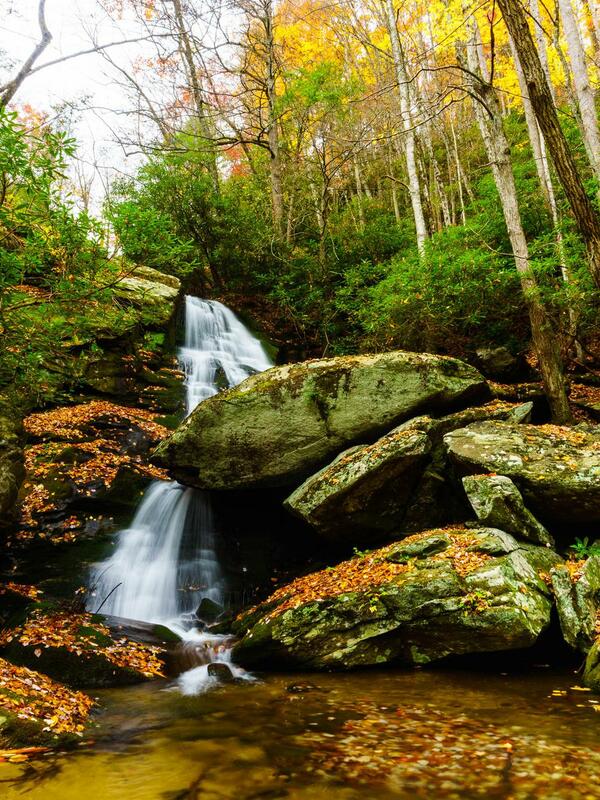 It travels gently downhill alongside Little Lost Cove Creek, with the rushing stream audible off to your right. 0.5 mi from the camp site, the creek gets noisier as it goes over the falls, and an unmarked "trail" leads to the right, straight down the mountain, towards the top of the upper drop of the waterfall. It was well-marked by flagging tape and a rock cairn on my last visit, but don't depend on that being there. It's in a stretch where the tree canopy opens up some but the rhododendron is thick on the left side, as the old road makes a gentle left-hand curve. There was a log lying along the edge of the old road in front of the side path as well. If you start to lose the sound of the creek, you've gone too far. This path plunges straight down a small ridge above the falls. This is extremely steep - do not attempt this if you're not experienced at off-trail mountainside hiking! The flagging tape led me right to the base of the upper drop just after joining up with an old logging skid path. The last few feet down to the base of the falls are particularly precipitous, but a tree's roots give you some little steps for footholds at least. From the base of the upper drop, you can almost see the top of the lower drop. Don't go downstream along the creek to reach the lower falls, though. Climb back up to the old logging path and go down that. It's still pretty steep, but not quite as bad as the first stretch. The path is fairly easy to stay on except for some deadfall being across it in places; try not to get off of it too much. You'll pass the top of the lower falls - stay away from the exposed rock. On my last visit, the flagging tape tried to direct me straight down the mountainside just past the top of the lower falls. Don't do that either - it's nearly vertical and not only is it dangerous, but you won't be able to traverse or descend that slope without dislodging the thin soils that overlie the rocks. Instead, continue down the old primitive logging path past the lower falls, to a point where it eases you down the slope to near the creek. Then, work your way back up the creek to the base of the falls. Return via the same path and remember to save energy for the climb back out.